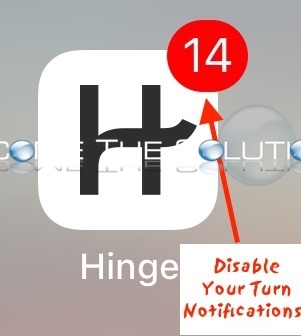 The Hinge app creators recently introduced Your Turn which notifies you when a match is awaiting your reply. As soon as this feature was released, the app immediately showed notifications for all your turn’s in the app badge icon (if you had notifications enabled). For those that were used to a notification only when you get a match, this was confusing and overwhelming. A Hinge reply includes “invited you to start the chat” or your turn to reply to a chat. Your match will show a blue Your Turn icon in the top right. Swipe left on a match with Your Turn displayed. Select HIDE. The match will now appear under HIDDEN MATCHES toward the bottom and the notification in the Hinge app will immediately disappear.